Red Hot! 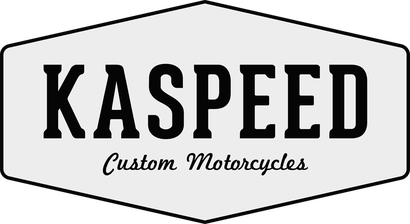 Paint and the Finishing Touches - Kaspeed Custom Motorcycles | Cafe Racer. Scrambler. Brat. Now it's finally time for a new layer of paint! 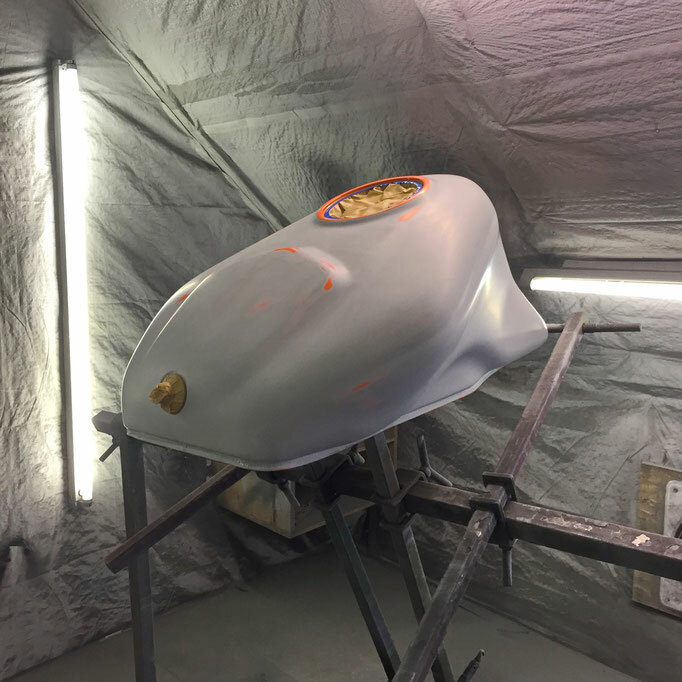 The frame got it's original color and the engine received a metallic charcoal grey. For the bodywork it obviously had to be a red shade for our Ducati. We wanted to keep the paint scheme simple to let the shapes speak. 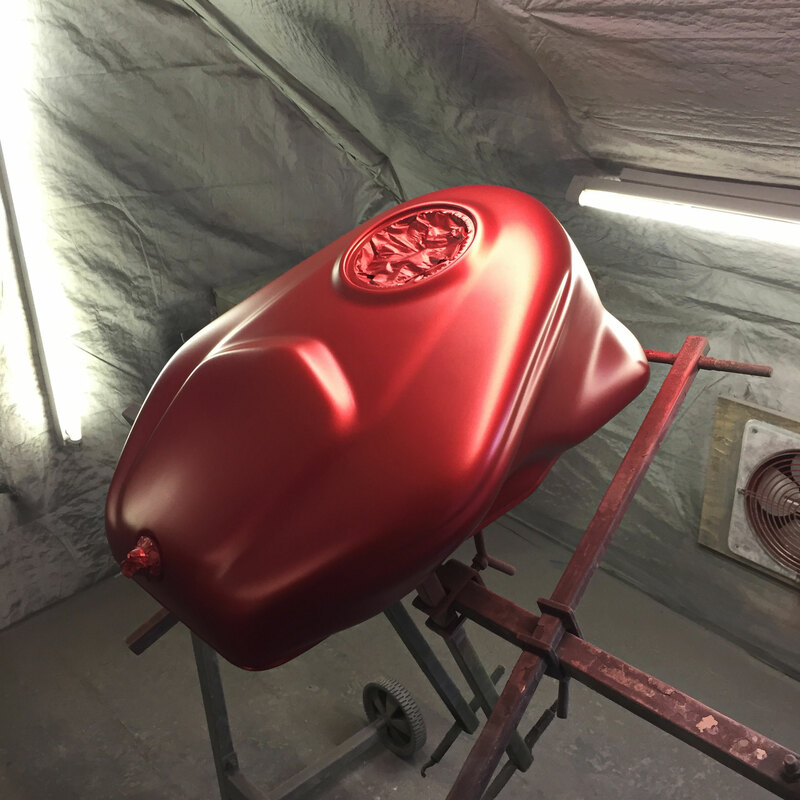 The paint is finished in Rosso Fuoco (fire-red) which is a sophisticated three-layer paint from Ferrari. 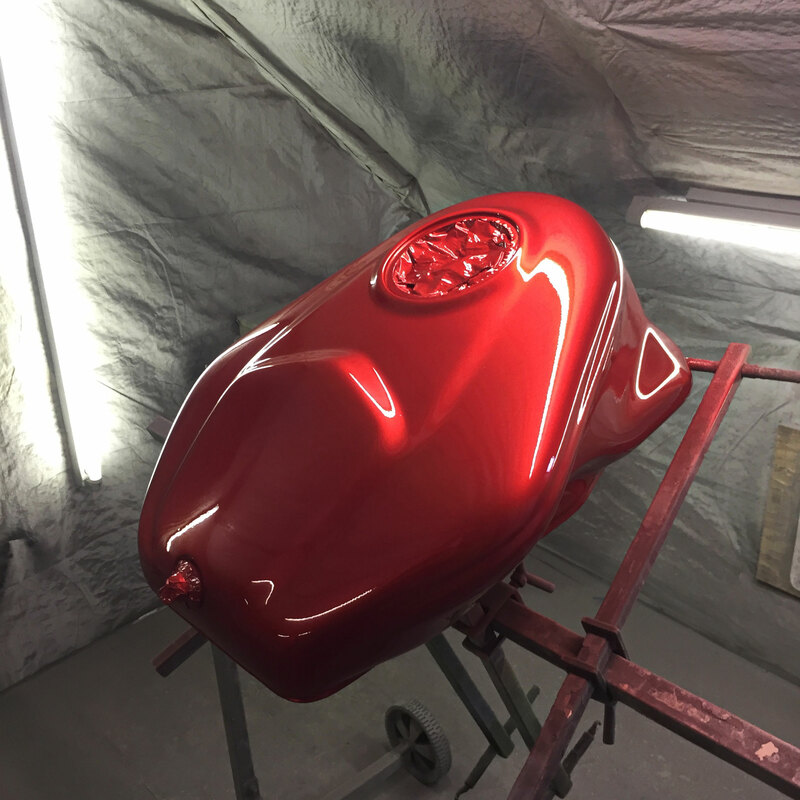 We actually do all paint work professionally in-house, since my borther is a trained automotive refinisher. 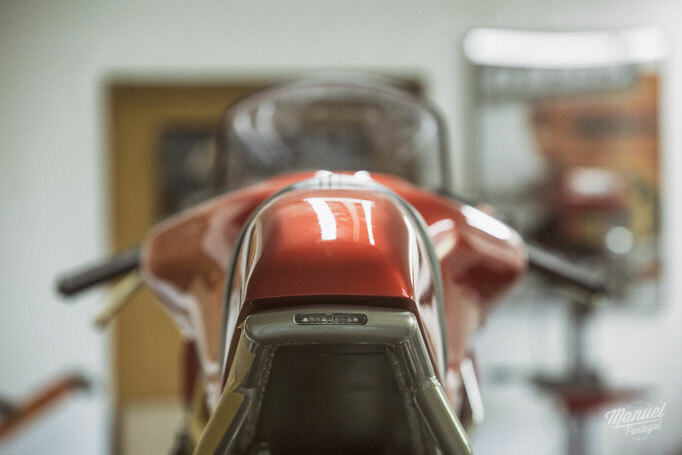 The added logo on the gas tank is a reminder to Ducati’s rich racing heritage. As stated, the engine and frame got a new layer of paint as well. Original colours were used on the frame and wheels. A fitting dark grey metallic paint was chosen for the engine to create a little contrast. 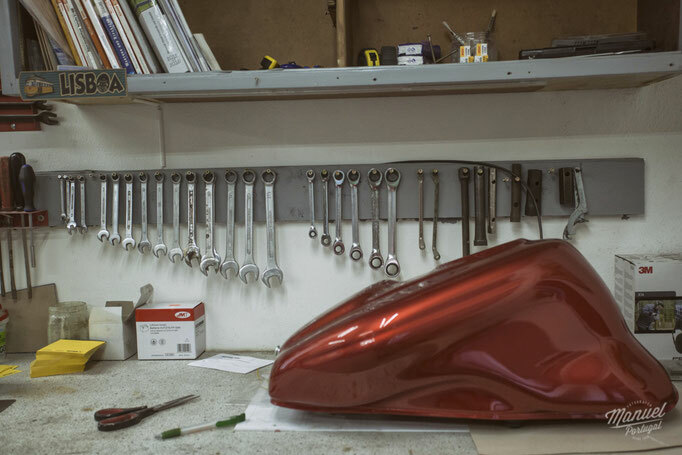 After paint and polish were done, we proceeded to final assembly and putting on the finishing touches. It's always great to see all the small bits and pieces come together. Only then you grasp what the bike really looks like in the flesh. To see how the vision and images in your head come to live is a great satisfaction. 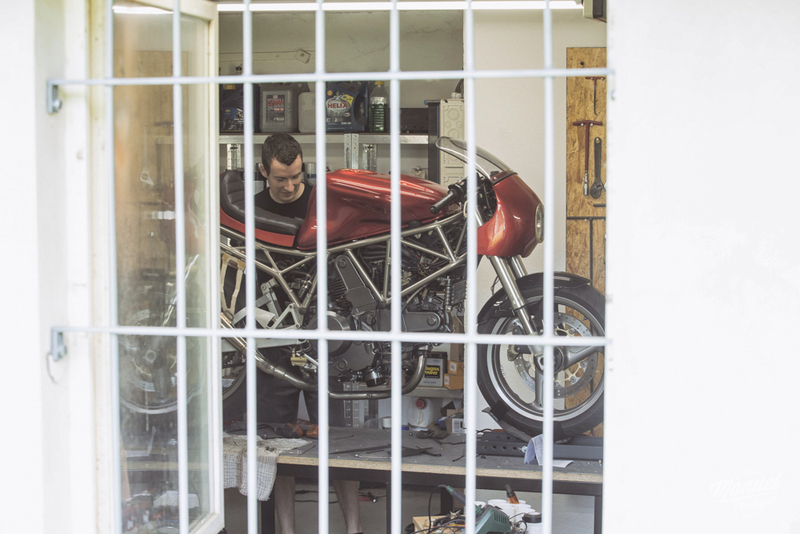 While completely stripping the bike, we refurbished all worn parts and integrated the new electronic components. The exhaust manifold was polished and we fitted two GP-style exhausts with custom mounts to underline the modern racer intention. It also comes with a custom stainless-steel license plate mount including Motogadget mini indicators as well as a small rear light, integrated in the rear frame tube. The wheels are now hugged by Pirelli Diablo Strada tires. All test runs went smoothly so she's ready for the streets. To have the Ducati fully road-legal in Germany, we took it to technical inspection by the TÜV. After we got the permit, we licenced the bike and finally went out for the first test rides! And man it felt good - so nimble and lightweight. That's it for this issue of the Build Series. Thanks for your interest! In the upcoming blog it's presentation time at the Glemseck 101. A real first for us and a great time. Feel free to share our story, follow us on social media to get every update, subscribe to our newsletter, bookmark this website and contact us any time for further information! Links at the bottom of this page.